When a beautiful model, Alison Parker (Cristina Raines), rents an apartment in a gloomy New York brownstone little does she realize the unspeakable horrors that await her behind its mysterious doors. Based on Jeffrey Konvitz's best-selling novel, this contemporary gothic chiller features jump-out-of-your-seat special effects and an incredible assemblage of stars including Ava Gardner, José Ferrer, John Carradine, Burgess Meredith, Deborah Raffin, Chris Sarandon, Eli Wallach and Martin Balsam. Alison likes her eccentric new neighbors, so it comes as a shock when she's told that, except for a strange old priest, she's the only tenant. Director Michael Winner comes up with something to terrify everyone in this spin-tingling exercise in supernatural suspense. Although it's not quite at the level of a cult classic, Michael Winner's 'The Sentinel' is nonetheless a memorable supernatural horror flick of the 1970s. Well, it is, at least, for those who grew up watching it, like myself. Granted, the movie is not nearly as scary as I once remembered it. But as a kid still developing a taste for the genre, this one succeeded at scaring the bejesus out of me, creeping me out with one spine-chilling moment in particular. Amazingly, that same scene managed to give me chills and goosebumps again — for a minute, I contemplated turning on the lights. 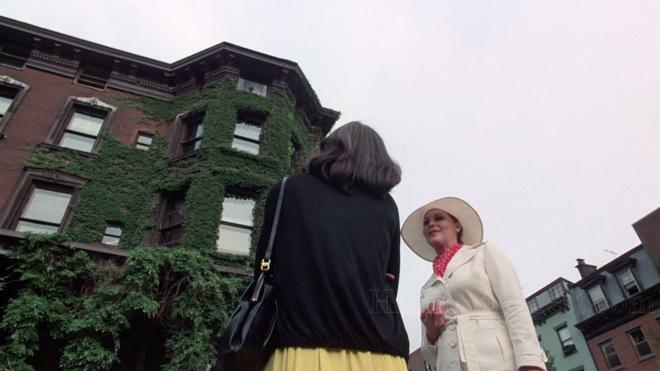 The scene in question shows Cristina Raines, as the beautiful but questionably troubled fashion model Alison Parker, walking through the empty Brooklyn brownstone house that she recently moved into at night. Converted and divided into separate apartments, Alison investigates the source of some mysterious noises, only to discover the entire building is inhabited by ghosts emerging from the shadows. Despite already knowing what was coming, the sequence still sent chills down my spine and scared me more than most horror movies have in the last couple years. And this is all to the credit of Winner's deceptively straightforward camerawork, the intentionally simple cinematography of Richard C. Kratina and the excellently timed editing of Bernard Gribble and Terry Rawlings. Together, they accomplished not only the scariest moment in the whole film but one which has been permanently etched to memory and ranks as one of the most terrifying sequences in cinema. (That's according to the cable network Bravo.) Up until that scene when Alison walks to the floor above hers in the middle of the night, much of the visual design had come with a rather prosaic, workmanlike feel, which of course was a deliberately misleading style to lull the audience into a sense of comfort. But in this moment, the camera lingered at a distance and colors had been heavily subdued, almost to the point of looking completely drained of life, and once the first apparition scurries towards the camera from behind the shadows of a door, the editing was slightly sped up. And before I'm suddenly crucified with accusations of spoiler blasphemy, revealing that Alison and Father Halliran (John Carradine), a blind, hermit-like priest who sits diligently by his window like a gargoyle, are the only two tenants doesn't exactly qualify as a spoiler. Not only does the movie's synopsis already let slip that little tidbit, but the story itself makes this information known less than half way into it. 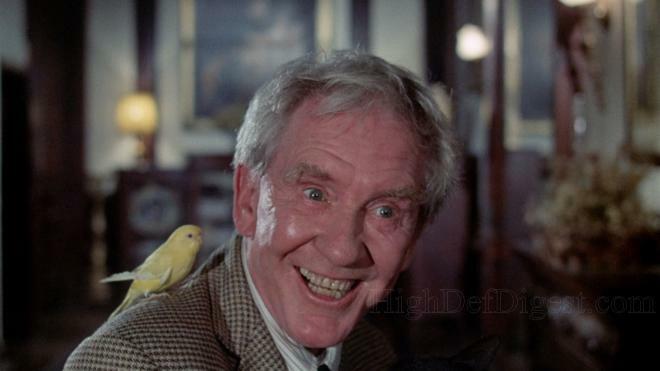 Alison's possibly imaginary neighbors include the highly-eccentric, busybody Charles Chazen (a brilliant Burgess Meredith), an overly-friendly kook who throws one of the creepiest and most bizarre birthday parties for his grumpy cat. 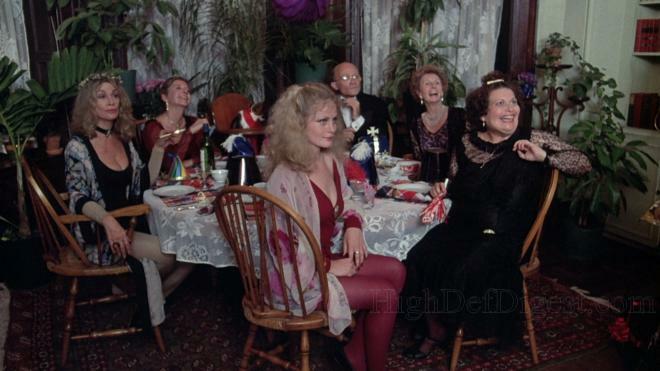 Even weirder are another pair, Sylvia Miles and a very young Beverly D'Angelo, who are the furthest from shy or bashful, making for one of the most awkwardly uncomfortable moments. Interestingly, the camerawork is not the only thing functioning with some intentionality because knowing the truth of these neighbors is not the real shocker. It's more a red herring to distract from the actual twist, which honestly is not all that surprising. Based on the 1974 novel of the same name by Jeffrey Konvitz, the plot is really about a kind of transcendence, an unbeknownst spiritual journey for Alison which leads to a sense of self-actualization and redemption. However, this underlining theme in Winner and Konvitz's script is at the price of some rather offensive implications. After learning the building is actually vacant, Alison, with the help of her lawyer fiancé Michael (Chris Sarandon), realizes her sensitivity and awareness with the netherworld is a gift, an aftereffect of two attempted suicides. And while that's a serious damnable transgression, more intriguing is the suggestion she lives a life of sin because she's a successful, independent woman. We meet Alison just when she desires to move out of Michael's apartment, to live on her own for a while before settling into a marriage. And the place she feels at home is also her journey's end for salvation, to abandon her wicked ways by sacrificing herself to a higher purpose — which, by the way, is still not anyway a spoiler unless you've seen the movie. In some ways, the story and its themes shouldn't come as much of a surprise because many productions of the 1970s were practically riddled with similar subject matters and concerns — more on the religious motif than on the particulars of a character's sins. In all honesty, this is arguably Winner's most worrisome sin and the movie's greatest weakness. 'The Sentinel' ultimately feels too much like an uninventive rehash of other, more successful films of the period with several scenes, moments and stylistic choices seeming almost — and unintentionally, I'm sure — imitative of 'Rosemary's Baby' and 'The Omen.' Of course, it was meant to capitalize on the popularity of supernatural chillers like 'The Exorcist,' but as a by-product of its time, it fails to truly stand out from the crowd or seem original enough to be deemed a classic. However, thanks to its most memorable and frightening sequence, it sits pretty in the minds of those who grew up with it, staring out a window like a guardian keeping watch of modern horror productions. Shout! Factory brings 'The Sentinel (1977)' to Blu-ray under the distributor's Scream Factory line. The Region A locked, BD50 disc is housed inside the normal blue case. At startup, the disc goes to a green static menu with full-motion clips, music and the usual options along the bottom. 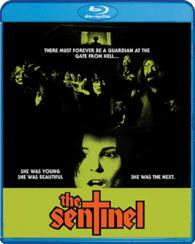 'The Sentinel' torments and terrifies the bejesus out of Blu-ray with a great looking 1080p/AVC MPEG-4 encode. Energetic and full of life, the 1.78:1 image shows bright, vivid primaries throughout, giving the picture pop and seem rejuvenated, while secondary hues are cleanly rendered, making flesh tones look natural with several fairly revealing close-ups. Although there are a few moments where things seems a bit drab and dour, likely due to the photography and the condition of the elements, contrast, for the most part, is stable with clean whites, and black levels are spot-on without ruining shadows details. The source used appears to have aged very well, showing excellent definition and distinct fine lines along buildings, the interior of Alison's apartment building and the funky 70s clothing. However, the movie could greatly benefit from a full restoration of the original elements since the transfer still comes with its share white specks, flecks of dirt and noticeable amount of softness. Nevertheless, the supernatural thriller manages to put on a good show. Things don't improve all that drastically in the audio department, but that's not to suggest they are any worse. 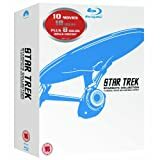 In fact, the DTS-HD Master Audio mono soundtrack is, for the most part, quite pleasing and satisfying, delivering clean, distinct dialogue that's precise and intelligible from beginning to end. Bass is pretty much as expected for a movie of this period, but it's audible enough to provide some weight to the music and the few bits of action. The mid-range is generally clean and can seem somewhat broad here and there; however, on the whole, the lossless mix isn't particularly dynamic or extensive with very little movement or clarity into the upper frequencies. Indeed, much of the action feels confined and limited to the center while sounding flat and even. There's also a good deal of hissing and noise in the background with a couple noticeable pops that tend to distract, revealing, once again, the movie could greatly benefit from a restoration of the original elements. But in spite of all that, the track gets the job done and fans might find little to complain about. Audio Commentary — A trio of commentaries kick off with writer and producer Jeffrey Konvitz having an enjoyable conversation with Nathaniel Thompson of Mondo Digital where he shares his thoughts and impressions of the movie compared to his original book. This is followed by a more surprising and revealing chat with director Michael Winner, who isn't afraid of sharing his true feelings of the production while also sharing memories from the set. The final track features star Cristina Raines telling listeners about what she remembers from her time on the production. Working with Winner (HD, 24 min) — A somewhat exhaustive but also fairly interesting interview with assistant director Ralph S. Singleton, who talks extensively about his career and work on this particular film while sharing anecdotes and thoughts on filmmaking in general. Still Gallery (1080i/60) — Production stills, promo photos, lobby cards and poster art. Trailers (1080i/60) — Theatrical previews and a TV spot. 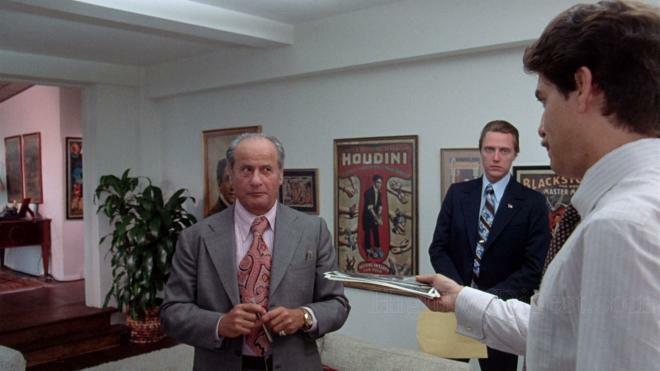 While not quite at the level of a cult classic, Michael Winner's 'The Sentinel' is nonetheless a memorable supernatural horror flick of the 1970s for those who remember growing up with it, particularly due to one nightmarishly terrifying sequence. Starring Cristina Raines, Burgess Meredith, and Chris Sarandon, Michael Winner's supernatural chiller hasn't aged well, but it remains an amusing watch with its one memorable sequence still effectively delivering the creeps. The Blu-ray arrives with a strong audio and video presentation that offers an upgrade to previous editions. Although the bonus features don't offer a whole lot, the overall package nonetheless makes for good purchase at the right price for cult enthusiasts and fans.